B safe 1st always... that is the message - Wont Help Himself? This is my chance to show that not so much who is right and who is wrong. But to show the side they are not saying. Why is that you have to ask? I can prove some of what they have said is not true. Again why did they say it then? You should be able to see even within the language used... about me? or against me? that this is not Professional or Appropriate. Even some of the things that had been said they are not a reason to not help they would (if they were true) be reasons to help. People believe I wont help myself, I'm the cause, I'm not ill, I am the problem and you name it. But if that’s what they (the bad people think) then so be it. But I wont YOU to read the extracts from the Documents I have. And when you clearly see that there are things being said that are not true. And that I am not talking just about one or two things. Then you start to see that the things I have been saying for years to all those that I have taken it to IS TRUE. Is it something I am happy about? No I wish it was different for myself yes but for others to, who DO suffer the same fate. Again remember that Vulnerable person in all this. Who's biggest crime seems to be "Help". There are already letters published from when I first started asking for help. I Originally started in 1996. Again I have been through already what Originally happened with CMHT. So after being knocked back I desperately needed help so I went back to the GP's I then had a referral if I was willing to pay to go private. I couldn’t afford not to was my conclusion. So I was referred to a Psychologist that I travelled to see forty pound a time. The extracts from a letter you will see below is why that Dr wrote to my GP's saying I couldn’t afford to see him anymore and needed re referring to my local CMHT (among other things.) This is the copy he sent to me first like he said he would with a little note you can see at the bottom. Wont help myself? You have to say that this type of argument is ludicrous. Note how the DR says how well I have done under the circumstances. My effort and willingness to help myself. What would change in the years that followed? One other thing at this time when I saw this Dr I did not know I had been Abused as a child this would come out later. This was sent 13th November 2000 and by January 2001 I would be in hospital. 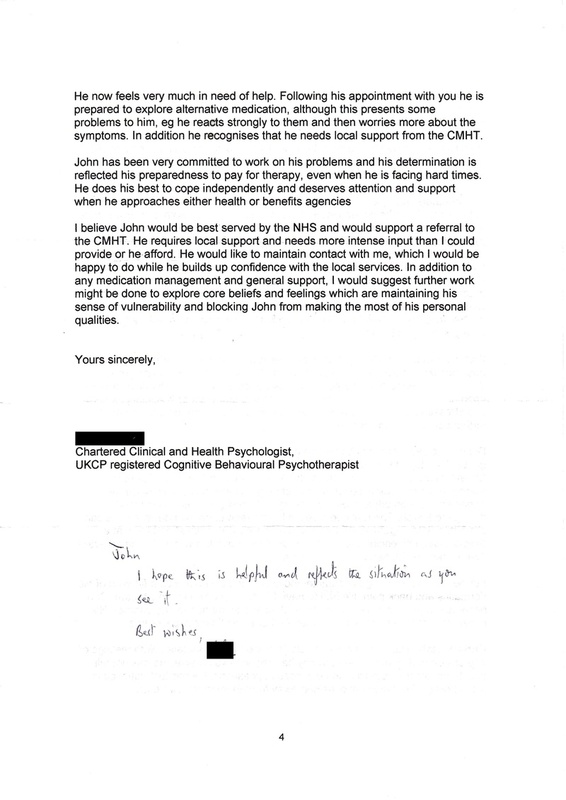 Now see below extracts taken from letters from CMHT. Now even if what they were saying was true (it isn’t) do you not see the attitude towards me in these extracts compared to the care and consideration by the first Dr's letter at the top. And what are they saying? Is it... wont help himself? Mmm you decide from the evidence from both sides one day I hope. First extract 20th January 2001 I was in hospital at the time. Why was I in hospital and on medication if I wasn’t ill? Mmm Ruminating? or trying to work it out? Dealing with it? Contemplating it all? NOT avoiding the pain in order to work out what is really going on? You decide. Especially with the events that would follow. Is there not an attitude that comes across in these letters not befitting of the Health Service THAT I DO BELIEVE IN? Its that along with myself I am trying to protect. This next extract was taken 27th April 2001 from my local CMHT again. What's that? "I took over the care of" Mmm does it sound like care? And "John's unwillingness to help himself" You cant see me but I scratch my head. That along with other things said keeps cropping up. And it is not true. I can and have proven this. If someone needs help and is vulnerable is it the way to go just to give up on them anyway? or to talk about them with such a lack of respect. Not in the health service I believe in it's not. It is not only a reason to help it is why someone may need it more than most. If it were true. The reasoning is breath taking and not rational. That’s not an insult its the truth. This person they describe is the same person that paid for help even when he couldn’t afford. And had been asking and enquiring about help since 1996. This is the same person who you will see below at the same time they were saying this was helping himself. If they would have listened to me they might have known. Also... Hurting people? I have to this day no criminal record. Thoughts of getting back at people, who have and do hurt you and who get away with it, are normal. The fact is... I (to this day) HAVE NOT HURT ANYONE... unlike them. 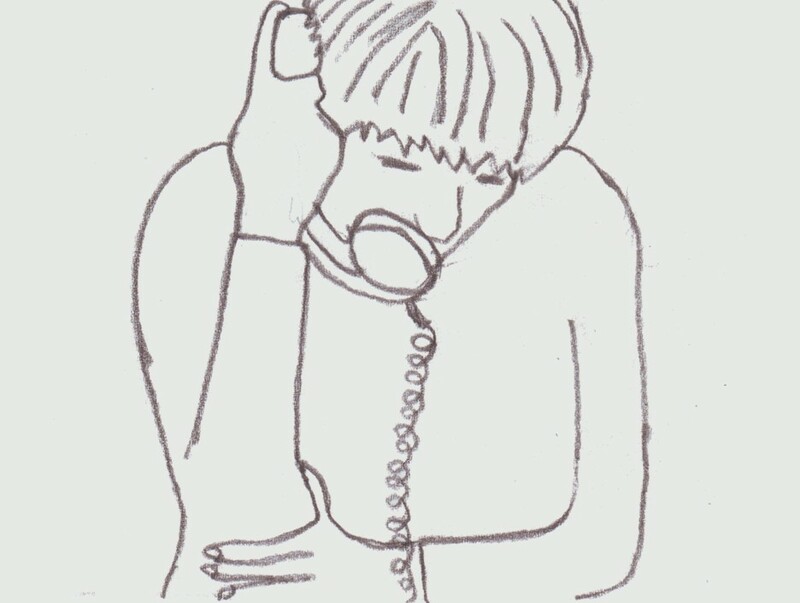 Remember the Vulnerable person in all this. 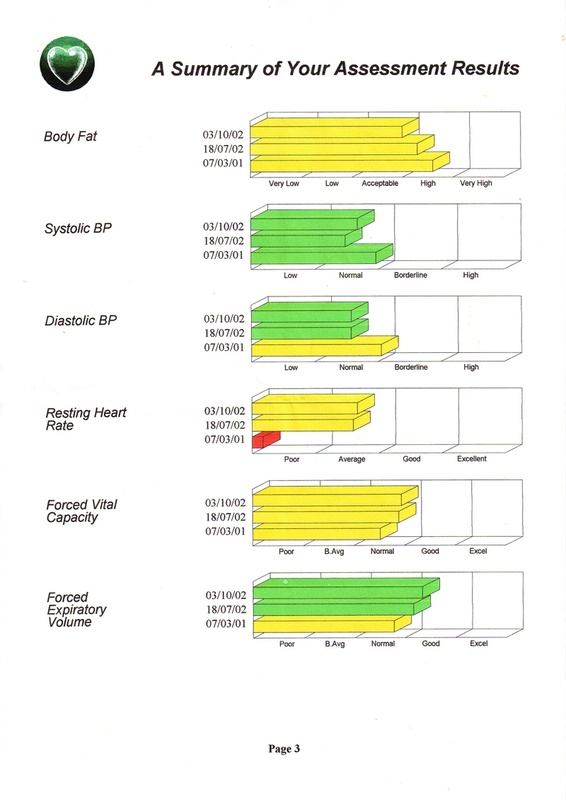 Below you will see a chart of tests done by a local health fitness centre that I attend. It clearly shows even without there support I did help myself. Extract taken from a letter 3rd October 2002. Wont help myself? You decide. Sorry for repeating that question but it is so repeated as a form of attack. I am using it to defend myself with the truth and I hope someone with an open mind reading it and making the only kind of conclusions that can be made sees this. The above table shows on the 07/03/01 when I was on the medication. When I was seeing the CMHT. And experiencing my problems with them. The other date is when I stopped taking all the medication they gave me. And started exercising going to the gym learning to swim and swimming six times a week. And I was facing my fears and problems. Despite them not because of them. I went from barely leaving the room life was over to doing all these things and my overall health improved though admittedly I still needed help and support but I received the opposite. And that after building up all my hope and strength is what led to "The Bridge" (on the Writings page) I spoke of earlier. Now even if you were still to have doubts about me. This all calls into question what is said and believed about me. I fight for True Accountability. To clear my name and to expose this with my story and my records. I fight to have it all amended. The law is absent when it has come to my rights. The Vulnerable Victim. There are supposed to be ways to have incorrect information held about you under the data protection act changed I tried this with the first port of call they made excuses and shied away leaving me helpless and vulnerable to it all. I really want people within the Health service as well to see the truth what is done in their name too. And one day some of those I have come across and I do understand have had such a low opinion of me. Maybe then they will be able to say they are sorry. And maybe we could move on forward together. I fear Dr's and the power they have. There are supposed to be consequences for braking all these rules. These along with other rules and laws are yet to protect me or even be enforced. Together we can... Break the Silence and End the Denial. Lets make them all Truly Accountable.